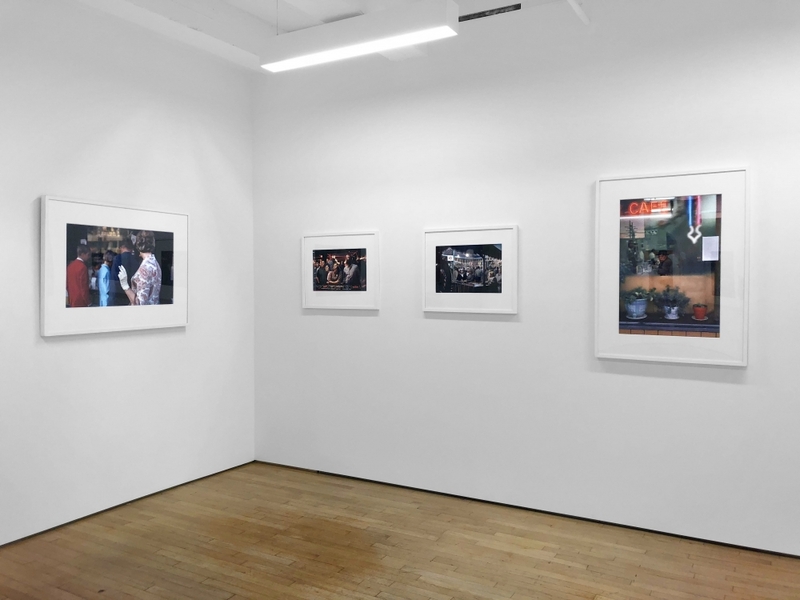 "In many ways, Herzog’s street photographs exist outside the context of 20th century color photography in America, or perhaps can be seen as a parallel or adjacent category of work. Some of the best images in this show take their cues from Walker Evans’ fascination with vernacular architecture and advertising, extending that interest in lettering, color, and brands out into dense layers of overlapping signage, as seen down city blocks lined with commercial establishments. When flattened by the camera, the eye catching names of hotels, arcades, cafes, and bars become an intricate patchwork of interlocked letter forms. Other images revel in storefronts covered with iconic branding (particularly Coca-Cola), or neighborhood barbershops and their distinctive angled stripes of red, white, and blue. But Herzog’s photographs never reduce these scenes to abstraction – people are nearly always present, giving his cacophony of visual stimulation both context and counterpoint. His snatched sidewalk portraits often use bold color as a compositional tool. A child’s red leggings match her mother’s skirt, a pink umbrella echoes a pink sign overhead, and a red bike and a red sweater repeat the colors of the soda pop signs nearby. And an overhead view of a bar called the Pink Door uses parked cars and the geometries of adjacent buildings to build up a frame filled with a rainbow of pastels. When Herzog steps back from the vernacular signage and color studies, the act of looking comes forward as a common theme. Pedestrians crossing Powell Street are spot lit by trapezoids of afternoon sun, an older lady in a red overcoat peers into a storefront window filled with Egyptian antiquities, a cigarette smoking woman turns to look at her family members browsing, and a cafe patron peers out from behind fogged glass. Two images taken at the carnival make this concept of seeing even more explicit, turning impromptu clusters of upturned faces into arranged tableaux, the hopeful eyes of various bettors mesmerized by the turn of the roulette wheel. In the end, there is a throwback mood to Herzog’s color images that feels wholly innocent (and as a result, a bit dated) – the pictures aren’t obviously freighted with conceptual ideas, art world references, or ironic observation. Instead, the photographs celebrate storefront and streetcorner discoveries with straightforward openness, pulling us back to a simpler time when a torrent of bold lettering felt genuinely optimistic."